Chainmail or (chain mail) refers to a type of armor consisting of small metal rings linked together in a pattern to form a flexible mesh. 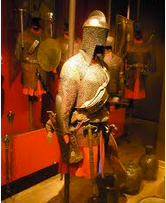 Mail was the earliest form of metal armor worn by the average soldier during the Middle Ages. The word “chainmail” is an English combination of two words: “chain” meaning a series of metal rings fitted into one another and “mail” from the French word “maille” which is derived from the Latin “macula” meaning “mesh”. As protection, mail had several advantages: it was flexible (allowing ease of movement), it was simple to make, it was easy and fast to repair, and it was inexpensive and could easily be fit to men of any size. This is an example of a bracelet made using Japanese mail techniques - quite different from the European 4 in 1 design pictured at the top of this page. The earliest example of mail was found in a Celtic chieftain’s burial site located in Romania. Although its invention is commonly credited to the Celts, there are examples of mail dating from at least the 4th century BC. Mail use spread to North Africa, the Middle East, Central Asia, India, Tibet, Korea and Japan. Rings (made by the village blacksmith...as an aside my great grandfather and my great great grandfather were blacksmiths so that is an interesting connection) were commonly made of iron but some later pieces were made of heat-treated steel. Wire for the riveted rings was formed by one of two methods: either the iron was hammered and cut into thin plates which were then pulled through a drawplate repeatedly until the desired diameter was achieved or an iron bar was forged (hammered) into a rod and then drawn into wire through use of a drawplate (picture above, right). Each ring composing a piece of mail would be riveted closed, welded closed or the ends pressed together. Each piece of mail was made specifically for whichever part of the body it was intended to protect. Is mail still used today? YES! Butchers, woodcarvers and scuba divers all use gloves or other protective gear made of mail. What decorative uses are there for mail? Mail was frequently used for the epaulettes of military uniforms and it is still used today by the British Territorial Army, and the Royal Canadian Armoured Corps of the Canadian Army. See picture to the left – pretty sharp looking, don’t you think?? 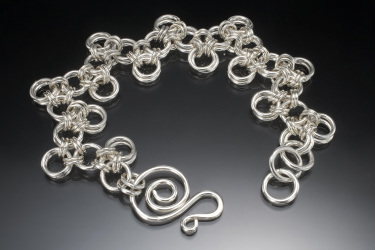 Mail has applications in sculpture and jewelry, especially when made out of precious metals. Mail has been used for Christmas ornaments, chess sets, and many other uses. Handmade Chess Set of mail! Amazing work.